When you link your webpage to another page or resource like an image or document on your website is called an internal link, or you can also call as hyperlinks which are considered either external or internal depending on target or destination. 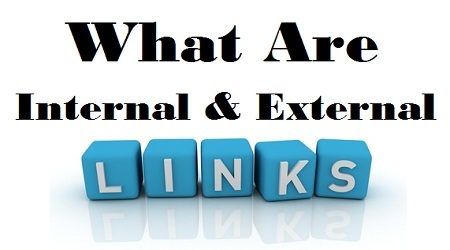 If you link to a page outside your domain or website then it is considered as the external link whereas a link that points at another section within your website or to another page then it is considered as internal links. If same organization has multiple domains and that is functioning as a single website like for example when a secure E-commerce website is used for purchasing things displayed on a non-secure website. In these case, links that are externally linked can be classified as internal links. Internal links finally points to your webpage or resource in the same root directory. So, if you link your main and sub-domain then in is considered as an internal link, like for example, a blogging platform, such as WordPress, Blogger or Tumblr host thousands of different blogs on sub-domains, which are entirely unrelated and the authors or owners are unknown to each other. In these contexts one might view a link as internal link only if it is linked within the same blog, not to other blogs within the same domain. Internal and external links lets the user to navigate to another webpage in your website. This is the basic or founding idea or principal behind the search engine optimization and through which users can navigate from one resource to another by clicking on hyperlinks. Internal links help users navigate within the same website, whereas external links generally take users to a different website. Both internal and external links help users surf the internet as well as have search engine optimization value. Internal linking allows for good website navigation and structure and allows search engines to crawl your websites easily.